We’re really pleased to have been featured in both the The Independent and the Evening Standard today. 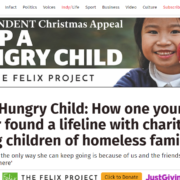 The Article tells the story of one of our service users and provides an insight in to the realities of being homeless in London in 2017 with two small children. We are so very grateful for the all the fundraising contributions that StreetSmart have made to Doorstep over the years, it’s really helped us to continue to make a difference to the families we support. Sadly we are not fully funded by Street Smart and we are reliant on donations and money that can be raised.